"Online Software for Your Home Delivery Business. Kiva Logic gives you an ecommerce website for your customers to shop on, and an admin area for you to manage your business." Online Software for Your Home Delivery Business. 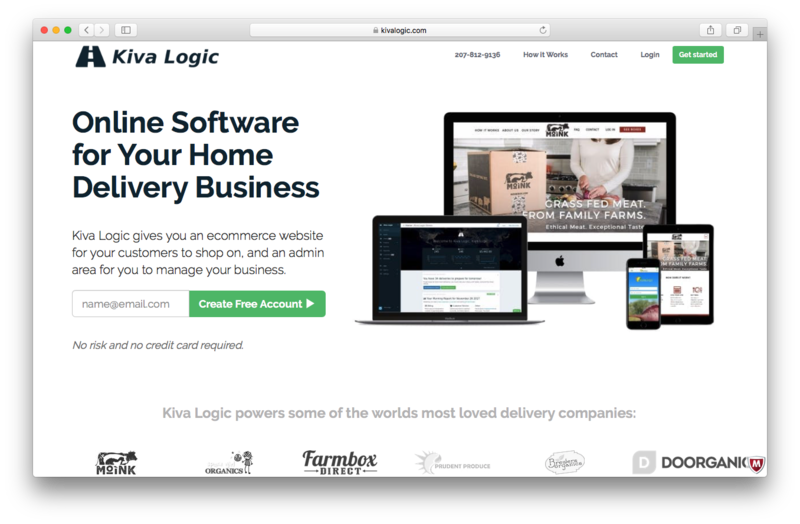 Home delivery software by Kiva Logic gives you an ecommerce website for your customers to shop on, and an admin area for you to manage your home delivery business. Delight your customers- We'll build a custom design for your website, and your customers will love how easy it is to sign up, shop and manage their account. Increase productivity- Our software is built to help save you time and automate monotonous tasks. Work Anywhere- As long as you have an internet connection, you can log in and manage your business from anywhere. There is a front-facing website for customers to use, and a back-end business administration area for you and your employees to work. Look & Feel- Your website will be responsive so when viewed on any device it looks beautiful. Use our proven theme for maximum customer conversion and interaction, or get in touch with us for a customer design. iOS & Android- Apps are now available for both Android and iOS. Use push messaging capabilities to boost your sales and increase customer interaction. Subscribe or a la carte- You can set up your website to have customers sign up for a subscription box, OR set your website up to allow customers to shop a la carte. Inventory management & reports- Use advanced reports to see inventory demand for each day of the week. Print PDF invoices for your vendors/farmers, and easily copy/paste a distributor order into an email. Easy add-ons- Products can be used in box menus, or simply as additional items. Use options for different sizes, and allow customers to have recurring orders of items. Optimization- Built-in integrations with Routific, Road Warrior, WorkWave, GPX formats, Viamente, RouteSavvy, or use our in-app drag-and-drop routing style to help route your deliveries. Routes - Customers are assigned a route and delivery day by postal code or suburb. Each route can have it's own cut-off time. Labels- Each order has it's own packing label. Labels have 4 quadrants and an order can have up to 4 seperate labels to fit your warehouse operations. Payment Methods- You can accept credit cards online using our Stripe.com, Authorize.net, Payfast.co.nz integrations. You can also allow customers to pay by cash or check. Billing Process- You can choose which day you want to run billing- the day before delivery, day of, or day after. The billing process is a simple 2 click process, or it can be set to run automatically for you. Customers receive a receipt email, or if their was a payment issue they'll receive an eamil asking them to update their billing information. Each customer has their own account that stores their contact info, delivery info, subscriptions, recurring products and more. Wholesale customers have access to a separate ordering interface and custom wholesale pricing, set by you. Grow confidently, our infrastructure scales with you to handle as many customers as you have. Our global CDN ensures rapid fast websites no matter what country you are in. Kiva Logic is a web-based software solution for businesses and organizations that provide home delivery services. Organic produce delivery companies, farms, community supported agriculture (CSA), pet food companies that provide home deliveries, and other similar types of businesses are the main customer-base the software solution caters to. Kiva Logic is essentially a robust and feature-rich online software solution for your home delivery business. The web-based eCommerce platform provides business owners and entrepreneurs a well optimized, mobile-friendly website for their customers to visit and shop in, as well as an admin area for them to easily and efficiently manage their eCommerce business. Using Kiva Logic, business owners can get their businesses operational and start their home delivery service quickly and easily. Joining Kiva Logic is simple and it all starts with the business owner sending an email to create a free account. The company will then get in touch within 24 hours. Interested parties may also send an email to sales@kivalogic.com and wait for Kiva Logic to respond. The whole process of switching or moving your eCommerce business to Kiva Logic is rather quick. The company is able to launch most businesses within just two weeks. Once a business signs up with Kiva Logic, the online eCommerce solutions platform will do most of the heavy lifting in transferring the business. Upon joining Kiva Logic, the first thing they will do is learn about your business—how it operates, the main processes, and to properly assess whether or not Kiva Logic is the right fit for your home delivery service. If you already have a working business website, Kiva Logic will check and see what the current shopping process is like for your customers to find ways for potential improvements. Once your operation—your business process—has been properly analyzed by Kiva Logic, the next step is setting up an effective solution. The web-based platform takes care of the process of getting your home delivery business online and operating on the Kiva Logic software system. If you don’t have an existing eCommerce website, the company will help you purchase a domain name and set up your business email account. During the setup process, the developers will start configuring the Kiva Logic software solution to match the customer’s business operation requirements. The developers will also update certain aspects of the customer’s business operation, such as how they will be able to accept payments online, how they will be able to manage route optimizations, which days of the week they should do deliveries, and more. 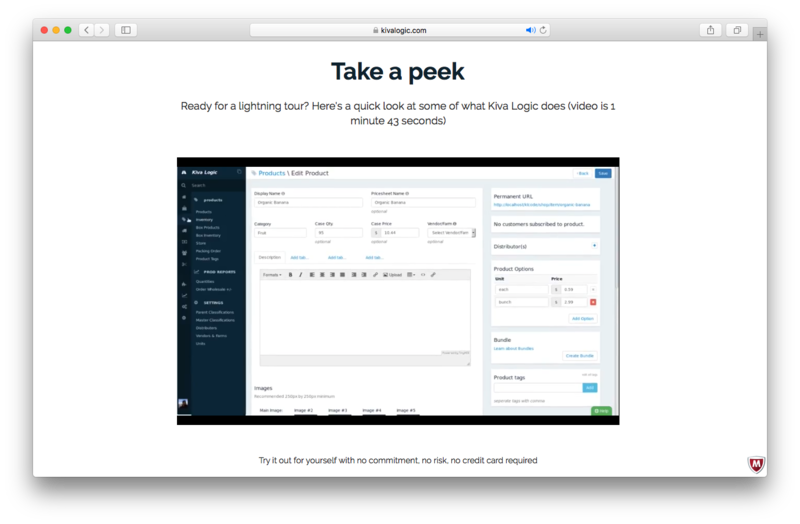 If you already have an existing business website, a custom theme of the Kiva Logic software solution will be developed in order to match your site. On the other hand, if you don’t have a working website, the developers will work with you to design and develop your eCommerce website. Data import is also covered during the process so you don’t have to worry about manual data entry. Once the assessment process, the setup, design, and data import are all completed, you’re ready to launch your website and your home delivery business. Experts will be on standby to help you out with any issue or concerns that may arise. You will also be provided with ongoing support to help you tackle any new challenges your business may face while utilizing the Kiva Logic solutions software. Kiva Logic is a feature-rich home delivery eCommerce solutions software that provides businesses all the important admin features they need and a good shopping experience for their customers. Upon joining Kiva Logic, users will benefit from the support provided by the developers in designing and building a fully customized eCommerce website. The website will not only match the business’ branding but will also offer a good customer experience for shoppers as well. The web-based software solution is designed to help home delivery businesses save time by automating repetitive tasks and processes. Through this automation process, especially with monotonous tasks, you are able to increase productivity by having more time focusing on other aspects of your business. Another benefit of the Kiva Logic eCommerce solutions software is the team of developers and experts that ensure the security and reliability of the system. Ongoing support is provided to ensure your website stays up and running 24/7 with a 99.98% SLA. The software solution provides security by performing offsite daily backups. Kiva Logic comes with a wide range of features for your eCommerce website, orders, products, delivery service, payment processing, customers, and business size. For one, because the software solution is web-based, users are able to log in and manage their business anytime and anywhere for as long as they have a stable internet connection. The solution has a front-facing website, which is designed for customers to use. It also has a backend designed for business administration, which business owners and employees may access to do some work. Kiva Logic is optimized for mobile devices and supports both iOS and Android systems. Apps are available from Google Play and the App Store. Users may also benefit from the solution’s push messaging capabilities to increase sales and improve customer interaction. Inventory management, reporting, easy add-ons, labeling, multiple payment methods, and the ability to accept credit card payments online through a number of processor integrations are just a few of the many features and benefits available with Kiva Logic. Pricing for Kiva Logic is straightforward. The setup fee will cost you $1500. The ongoing fee is $1 per order processed with a minimum of $150 per month. If the customer has a few custom features they want to be added to the solution, features Kiva Logic does not already have available, there may be additional fees required to incorporate those features. For enterprise pricing of more than 1,450 orders per week, you may contact the Kiva Logic sales team directly. Interested parties may also visit the service provider’s official website for more information about the eCommerce solutions software, custom pricing, and other pricing options that might be available. Kiva Logic is an eCommerce solutions software specifically designed for businesses that provide home delivery services. Its features and capabilities are tailored to address the crucial needs of home delivery service providers, whether it’s a fully online business or a brick-and-mortar establishment that offers door-to-door deliveries. The web-based platform supports businesses from the setup process all the way to the launch of the website. Kiva Logic users can expect ongoing support from experts to help improve their business process and increase customer satisfaction. Kiva Logic is also optimized for mobile use, which enables admins and employees to manage the business anytime and anywhere. This also allows customers to access their accounts and shop for their needs by simply using their mobile device. Product recommendations, vendor rankings, market overview and tips on how to select eCommerce Solutions software for business. Published in April 2019. What is Kiva Logic generally used for? The Kiva Logic platform is used to provide an ecommerce website for your customers to easily sign-up, shop, and manage account information, along with providing an administrative area for you to manage your business. Kiva Logic handles all of your customer manage, products, inventory, label printing, route management, billing, discount codes, and everything else you need to run your home delivery business. Kiva Logic runs completely online and is accessible from any device with an internet connection. Kiva Logic can be run on your businesses main domain. Does Kiva Logic integrate with any other apps? Contact us if you are interested in an integration with a web service. What platforms does Kiva Logic support? For online payments, Kiva Logic is integrated with Stripe.com, Authorize.net, Payfast.co.za (for South Africa), and Moneris. For route optimizations, Kiva Logic has integrations for Routific, WorkWave, RouteSavvy, MapPoint, and others. Don't see your route optimization service provider? We'll build a new integration for you! Does Kiva Logic offer multi-user capability (e.g. teams)? Yes, you can have as many administrative users as you like, and there is no limit on customer accounts. Does Kiva Logic offer guides, tutorials and or customer support? Yes. The Kiva Logic software is extensively documented on our documentation area of our website, and there are constantly new blog posts and changelog updates to keep you posted on what's new. We have no limits on training to get your business up and running on the Kiva Logic software and continue to provide unlimited technical support for your business while you are a Kiva Logic customer. Who are the main user groups of Kiva Logic? ...and many other types of subscription based or a-la-carte based home delivery businesses. What are some applications Kiva Logic is commonly used in tandem with? The most common applications this service is commonly used with are Stripe, Authorize net, and Routific. Does Kiva Logic offer an API? No API is available at this time.